Normally, a utility closet doesn't have to look pretty. It's all about the utility more than anything else, right? In addition to the hot water heater, our closet is also home to the only sink (minus the bathroom) in the office. Meaning, it kind of functions as our "kitchen." And for a kitchen, this space was rough. 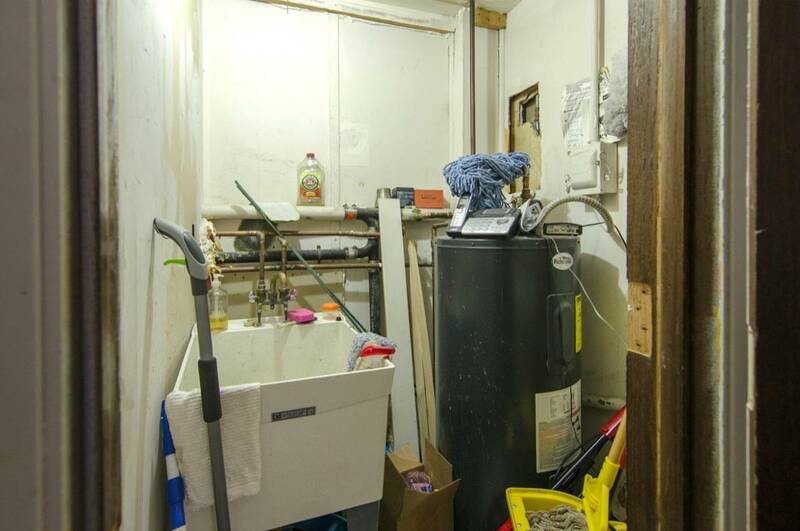 Before: Just imagine trying to wash dirty lunch dishes in there! Before starting our mini-renovation project, we needed to determine what the function of the space was going to be. First off, we needed storage. We absolutely had to have space to store cleaning tools and supplies, along with a few other odds and ends. Next, we needed a clear path to the sink , so everything had to come up off the ground. And finally, the entire closet needed a facelift to bring it from a place of dirt and grime to having a fresh shine. In case you can't tell from the before shot, this closet is small and dark. While doing the initial cleaning and painting, we used a few Husky lights to brighten the darkest corners of the closet. Bruno cut in the edges of the room while using the Husky LED headlight, which kept his hands free to paint. We needed additional light while cleaning, too (I won't go into the details of how filthy this room actually was, but I'll just say we used a lot of bleach). We made use of both Husky's mutli-use light (which came with a handy hook on the back! ), and the Husky magnetic LED clip light (which thanks to its magnetic back, we were able to just pop it on the hot water heater while we worked). This thing cuts wire like it's butter! After the utility closet got scrubbed and polished, we set to work mounting wire shelves to deal with the storage issues. We decided to cut our wire shelving to size, rather than hang shelves that were too short. Cutting thick wire like this is an easy task for Ryobi bolt cutters, especially when paired with this mega 18-volt battery. I don't know if you've ever tried to cut wire shelving, but without the right tools, it's almost impossible. Or at least, it involves a lot more swearing. Thanks to this bolt cutter, we trimmed our shelves in under five minutes, and kept it PG. What else are the Ryobi ONE+ Bolt Cutters useful for? Aside from not tiring out your arms like manual cutters do, you can use them to cut through heavy chains, locks with missing keys, and any bolt up to 3/8th inch thickness. While working on the closet, one of the biggest hurdles was dealing with the unusual walls. They're like a quilt: a patchwork job. There are boards nailed in random places, half-done repairs to holes in the drywall, and majorly uneven surface areas. These shelves needed to be as flat up against the wall as possible for them to be sturdy and secure, so we used a flush-cut blade to remove sections of the some of the hurdles in our way. LOVE this Milwaukee hammer drill! The storage system we ended up using was the CLOSETMAID brand; this system didn't require a lot of installing tools; all we used was a level, a hammer, and a cordless drill. If you can't tell from the pictures, there were a lot of pipes to navigate around. Figuring out how to hang the shelves in a structurally-sound way took a bit of finagling. Ultimately we ended up using a combination of side brackets, support brackets, and drywall clips. We cannot rave enough about the Milwaukee hammer drill. It's our current favorite obsession, and here's why: It comes with a 5-year warranty on the tool, it provides the most control and power we've ever experienced in a drill, and when offered as part of this kit, it comes with an equally impressive impact driver. With the shelving hung, all we had left to do was organize this utility closet and figure out how to deal with all those dang pipes. We made a makeshift curtain from scrap fabric, and hung it from the lowest shelf to mask some of the plumbing. We also wall-mounted our brooms and mops, and grouped cleaning supplies and utility items together in baskets on the shelves. Ready to see the end result? Ta da! Isn't she a beauty? It's kind of silly to get this excited about a closet, but it's such a serious improvement. Everything is within reach, there's nothing to trip over, and it's finally clean. Now whenever I walk into the utility closet to grab a broom or wash a dish, I breathe a sigh of relief instead of anxiety. In the end, the biggest thing we took away from this utility closet makeover is how little improvements can have a big impact. All we had to do was clean, paint, and hang some shelves, and our utility closet is unrecognizably transformed. Looking at these before and after images, I'm never going to underestimate the power of a little cleaning and organization again! WOW what a remarkable difference! My workplace has a similarly terrible utility closet/hall situation, I dread having to find anything in it. Time to grab my coworkers and a paintbrush! This is pretty clever. I may employ the curtain trick in my own laundry room.